Staged resection is preferred to treat synchronous rectal cancer with liver metastases. Simultaneous resection of rectal cancer with synchronous liver metastases may potentially decrease postoperative complications, thereby improving quality of life, decreasing health care costs, and avoiding delays in postoperative chemotherapy administration. We evaluated the safety of simultaneous resection. We searched Medline, Embase, and PubMed for studies comparing simultaneous versus staged resection. Study selection, data abstraction, risk of bias (ROB), and quality of the evidence (QOE) assessment were performed in duplicate. The primary outcome was overall postoperative complications. The secondary outcome was postoperative complications in the intervention group. ROB and QOE were assessed using the Risk of Bias in Non-Randomized Studies of Interventions (ROBINS-I) tool and Grading of Recommendations, Assessment, Development, and Evaluations (GRADE). 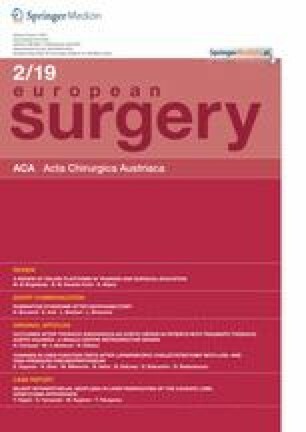 4456 abstracts were retrieved; 18 retrospective cohort studies reported postoperative complications in the intervention arm, with six comparing intervention (288 patients) to control (287 patients). The odds ratio (OR) for overall complications was 0.93, 95% confidence interval (CI): 0.64–1.35, and for major complications was 0.77, 95%CI: 0.40–1.50. Proportion of complications (intervention arm): 41%, 95%CI: 33–50%. ROB was moderate. Simultaneous resection of synchronous rectal cancer with liver metastases carries a similar risk of overall and major complications compared to the staged approach. However, QOE is very low and a simultaneous approach ought to be pursued only in selected patients until better evidence is available. 1. Americas Hepato-Pancreatico-Biliary Association Meeting, Apr 2017. Miami Beach, Florida, USA. 2. Canadian Surgery Forum (Canadian Hepato-Pancreatico-Biliary Association), Sept 2017. Victoria, British Columbia, Canada. The data analyzed for this manuscript are included in this article. AEG screened the articles found, entered the data into RevMan for the meta-analysis, and was a major contributor in manuscript preparation. MV conducted the initial literature search and served as the second data abstractor in screening the studies for inclusion. SP carried out the meta-analysis and ensured all data points were verified. EF served as the mediator of conflicts. LR helped with the initial design of the systematic review and manuscript preparation. MS contributed in manuscript preparation. PES also took part in designing the systematic review and manuscript preparation. All authors read and approved the final manuscript. The online version of this article ( https://doi.org/10.1007/s10353-019-0582-0) contains supplementary material, which is available to authorized users. Special thanks to Dr. Aristithes Doumouras and Ming Bi for their assistance in translating selected abstracts and full-text articles. This research did not receive any funding from funding agencies in the public, commercial, or not-for-profit sectors. A.E. Giles, M. Valencia, S. Parpia, E. Fu, L. Ruo, M. Simunovic, and P.E. Serrano declare that they have no competing interests.